Becoming more consistent with each passing release, Aborted have been growing into the veteran status with no loss of energy or excitement. In fact, one could even make the argument that they continue to get better with age. For one thing, they’ve firmly established who they are as a band. When you open up an Aborted release, you have a good idea of what’s going to blast out of the speakers. Yet they continue to add nuance and flavor with each new album. Their latest, TerrorVision, sets quite a high bar for the band. In addition to the usual brutality, there’s a darker maturity behind it all. Atmosphere and melody find their place within the scorching death/grind they’ve become known for without lessening its impact. It’s a pleasant evolutionary step, done with plenty of death metal grace. We grabbed the band’s newest member, bassist Stefano Franceschini, to talk about TerrorVision as a whole, his view coming into the band, as well as his thoughts on death metal today in 2018. Dead Rhetoric: As the most recent member of the band, what has it been like for you to join in? Stefano Franceschini: It’s actually been a pretty cool ride. It was 2016 when I joined the band, and it was a bit of a surprise for me as well. I got a call from the guys that they were looking for a new bass player. It kind of shocked me in a good way, and they never made me feel like I was the ‘new one’ because they involved me right away in the writing process and just asking opinions about what to do next in every aspect. Especially with TerrorVision. I really love how I was able to interact with the band, and I really appreciate them not treating me just like the new member. Dead Rhetoric: Do you feel the band has really found its identity with the ‘80s horror aesthetic? Franceschini: Up ‘til now, I would say yes. The band has always had a thing for horror imagery, but with Retrogore, the love for horror movies got a little stronger. With TerrorVision, it’s gotten stronger. You can see it in the colors of the artwork and the name of the album – it’s a sort of tribute to B-horror movies. The concept is a little different, but yeah, I think it’s positive and I think it’s safe to say the band is kind of locked in with the ‘80s horror imagery – both musically and lyrically. 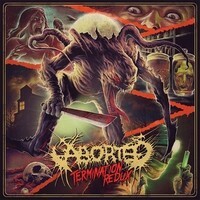 Dead Rhetoric: What makes TerrorVision stand out for you, from the rest of Aborted’s discography? Franceschini: Personally, I’d like to say that it’s the most ambitious album the band has done. It took us so long. We deliberately wanted to have it be a long process when it came to songwriting. We didn’t want to write another Necrotic Manifesto, Global Flatline, or even Retrogore. Since the moment we decided to write a new album, we didn’t want it to be a copy of our last works. We are a death metal band for sure, but we wanted this new work to sound a little different. By that, we tried to incorporate more atmospheric parts and wanted it to sound darker. Some of the songs are pretty long and the structures are kind of complicated. I wouldn’t see this as the standard death metal album, even if it fits into the death/grind genre that we play in. There’s definitely something different, which makes it stand out in a few ways from our last few records. Dead Rhetoric: I would agree as well – there’s definitely more atmosphere and melodies, even if it still sounds like a bulldozer. Does the atmospheric sections kind of combine with the ‘80s horror vibe too? Franceschini: I agree – if you listen to the intro, it’s a reminder of what the listener is going to get into after those first 40-50 seconds. We have this eerie introduction to the album, and some keys/synths in a couple of songs. We tried to deliver a horror-kind of experience, not just lyrically. If you listen to the intro and “TerrorVision” itself, as well as “Squalor Opera” – the two singles, but it’s also on a few more songs as well. We tried to deliver the horror-vibe more on this album than any previous one, I would say. Dead Rhetoric: Also as the newest member, does the relatively stable line-up allow to help push the boundaries forward with each new release? Is there a certain level of comfort within the band structure and how they write? Franceschini: Totally. Since day one, when we went to the practice room and rehearsed songs for a show we had the following day, they were easy to go with. There is always a lot of fun. There’s been literally zero drama too. Things have been really easy in every aspect: tour planning, songwriting…they are some of the easiest guys to work with and it’s a lot of fun touring. It can be very stressful because you are away from family and that sort of thing, but with Aborted, there’s a really strong connection. It’s something that goes beyond the music business piece of being a band. Dead Rhetoric: Is there a constant push for more creative merch? It seems like Aborted put out a number of great, fun designs? Particularly in the more recent years. Franceschini: It all comes down to us being video game and movie nerds. We always try to reach out to people who are like us – metal fans that like playing video games, watching horror movies, or eating fast food [laughs]. For example, I’m thinking of the Dark Souls one, or the Cuphead shirt, or any horror design with some puns on the back. These are pretty much all Sven [de Caluwé]’s ideas. He takes care of designs and that kind of stuff. We try to send a horror or gore design, and some of them are meant to reflect what we like doing everyday like any metalhead out there. Dead Rhetoric: Likewise, Aborted are usually down with some bathroom humor. Do some bands take death metal too seriously? Franceschini: [Laughs] Who am I to speak for everyone, but I think it depends on the moment in time a given band started. I could never picture Deicide doing something super-ironic but it’s because they stick with a certain type of imagery, which I respect, because it’s been consistent. The same with Morbid Angel or Behemoth. It’s all about some dark spiritualism or Satanism…that sort of stuff. Those things don’t leave much room for irony or things like that. It’s really all about the imagery of the band, and depends on what kind of music you have been playing since the band began. Aborted has the surgeon and the butcher – there’s a serious message with the music, it’s dead serious but sometimes we love to have fun. We want to have fun with the music we like to play and tour as much as we can doing that. If we are going to print a t-shirt with a funny design, we are all about it. Sometimes it might be taken too seriously, but I also understand that because of the band’s imagery. Dead Rhetoric: You are also in Hideous Divinity. How do you portion your time between bands? Franceschini: I think it’s been a huge dose of luck. The priority right now is Aborted, especially when it comes to touring. Every time a Hideous Divinity commitment came up, I would be available. For example, we [Hideous Divinity] did a tour supporting Origin and Rings of Saturn – I was in the middle of tracking with Aborted. We also shot a few video clips and played a few shows in Europe. The last show we had on that run, I basically said bye to the guys and hopped on the bus with Origin. I met with the Hideous Divinity guys the next day. I think it’s also because I try to plan stuff in advance, as much as I can. Whenever there was a show with Aborted, I would tell our booking agent so that we could try to work something out with [Hideous Divinity] and in the worst case scenario, they would get a replacement. But so far, it hasn’t happened. Hopefully it will stay like this forever [laughs]. But I also hope that Hideous Divinity continues to get bigger and bigger, maybe to a point where some sort of decision has to be made, but that would be long in the future. 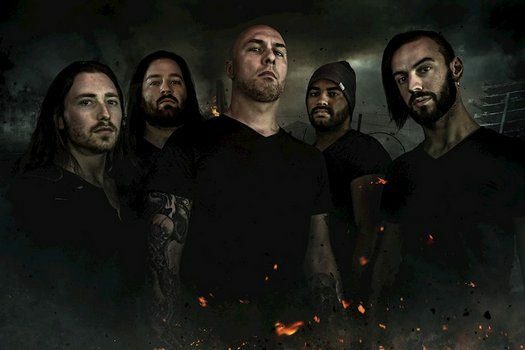 Dead Rhetoric: Aborted recently posted asking what bands you should bring on tour. Who would you choose to tour with, if you were making the call? Franceschini: I would definitely like to do a full 5-6 week tour with The Black Dahlia Murder, Cattle Decapitation, and with new bands, Rivers of Nihil. Their new album is really cool. And Behemoth of course. I’d love to tour with them. Dead Rhetoric: Being that you are involved in more than one band in the genre, what’s good about death metal right now? Franceschini: I think there’s a lot of quality when it comes to releases. Sometimes you might say the market is oversaturated. But I think people are still able to make a choice, like “What band do I want to support now?” Obviously, you can’t buy every record from every band you like. In this year alone, there are so many releases. There’s Behemoth, Deicide, Hate Eternal – a lot of top tier extreme metal bands. When it comes to motivating young people and young musicians, this is great. Also, for the touring market itself. You might think that the death metal market, at 30 years, is kind of done, but all these bands, the classic ones are still out there touring the world, which means that metal hasn’t been stronger than it is now. I think it’s a good thing. Dead Rhetoric: You recently finished up a US tour at the start of summer, what’s next on the horizon as we approach the release of TerrorVision? Franceschini: TerrorVision will be released on the same day as the first date of our Australian tour with The Black Dahlia Murder. That’s an 8 day tour with them. Then we will have a headlining run in Europe with Cryptopsy, Benighted, and Cytotoxin. That’s going to be a 5-week tour. We are in the middle of planning for next year. But we have those two tours for now, and we are definitely planning to get back to the US, probably early in 2019. Maybe in the spring. We have visas, so we’ve got to make it back before they expire [laughs]!